Chance of Axar Patel replacing Hanuma Vihari because of his familiarity with PCA Mohali stadium. Since 2014, only 4 out of 14 games have been won by sides chasing. 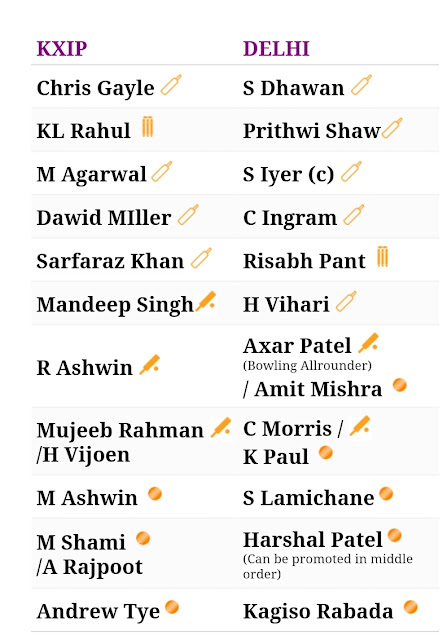 *No Chris Gayle or Andrew Tye for Kings XI tonight. Mujeeb and Sam Curran are back. 🏷️Must Watch Video for Player Battle, Best C & VC Choice and details on each player. *Pick D Khan or Dawid Miller as per your choice. 🏷️Player who are facing Video List Loading issue and Incorrect Timer of deadline Please update this app from Play Store.